I’m a huge fan of the Dinosaur Rescue series by Kyle Mewburn and Donovan Bixley. They’re hilarious adventure stories full of all sorts of disgusting things, they’re chock-full of prehistoric facts and perfect for younger readers. The second bind-up of Dinosaur Rescue stories (books 5-8) has just been released by Scholastic NZ, which contains Spino-rottysaurus, Dako-snappysaurus, Scuto-stickysaurus and Salto-scaredypus. One of the added extras of these mash-ups that I really like is the Meet the Creators pages in the back. Donovan’s prehistoric likeness of himself and Kyle makes me laugh every time I see it and their answers to the questions are so funny. 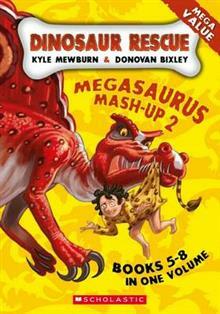 Thanks to Scholastic NZ I have a copy of Dinosaur Rescue Megasaurus Mash-up 2 to give away. All you need to do to get in the draw is enter your name and email address in the form below. Competition closes Monday 17 June (NZ only). Thanks to everyone who entered. The winner is James. My 8 yr old daughter loves these!